I’m on my hands and knees in the men’s bathroom of a local pub, and things are a bit of a mess. There’s yelling and wriggling, and I’m praying that no one else comes in for the next few minutes. I’m changing my 6-month-old daughter’s diaper, and this place — like many — doesn’t have a changing table in the men’s room. I’m not sure what I expected: It’s as if being a man and being a parent are strangely incompatible. Growing up, we had pop-culture dads running the gamut, from Danny Tanner to Homer Simpson. And if I wanted a little color, aside from Cliff Huxtable, I might tune in to Family Matters’ Carl Winslow or The Fresh Prince of Bel-Air’s Uncle Phil. These last two were both larger black men with quick tempers and upstanding jobs (police officer and lawyer, respectively). The irony is that two of the most popular black dads of that era were part of the system responsible for the great lack of fathers in communities of color. The ambivalence continues: Fatherhood (and the absence thereof) is jointly blamed for the breakdown of nuclear families, increased crime and violence in communities of color, poverty in our cities. At the same time the predominant image of fatherhood is that of the disengaged dad. We have an ambivalence about fatherhood, and it’s even more dramatic for fathers of color. When folks want to critique high rates of crime, poverty, violence and incarceration, it doesn’t take long for black fathers to come under fire, instead of falling property values, the difficulties and inequality involved in accumulating wealth, or previous exclusion from programs like Social Security and the GI Bill. Instead of discussing the impact of running highways through neighborhoods, Rockefeller drug laws, or disproportionality throughout the criminal legal system, the message is that if black fathers were at home with their children — and married to the mothers of those children — then all these intractable and intergenerational issues facing our community would evaporate. I know that sexism exists. I know that the way that we do gender in this country is unfair and destructive. Women are on the downside of this power asymmetry and face what author Dr. Brené Brown has called “a minefield of conflicting and competing expectations” that will never come my way. But in this country, at this moment and for a long time now, parenthood has equaled motherhood. For good and for ill, the idea of a nurturing, caregiving, supportive and engaged parent has been the image of the mother. And since this country has deeply racist roots, that image is a white mother. The social expectations of my own child’s white mother and black father are miles apart. My wife is expected to be at all of my daughter’s doctor visits, so no one is surprised that she’s there. I change one diaper and I’m walking out with the “No. 1 Dad” T-shirt. Again and again, I am faced with how unsupported our position is as parenting partners. I’m not told to trust my fathering instincts and intuition, and I’m changing my daughter’s diaper on the bathroom floor. There are baby groups, message boards and classes for moms, and a whole array of other supports — plus lack of paternity leave for many fathers — that tell me that I’m not and shouldn’t be an equal partner in the rearing of my child. I started getting these messages long before my daughter was born, at our prenatal appointments. There I was treated as a benign anomaly. When listening to the heartbeat or during different parts of the exam, I wasn’t even sure whether to sit or stand or what. Our midwives were great and worked to make me feel included. It’s just sad that it has to be work — and while I buck at many of the social roles and expectations that I’m handed, it’s still nice to have them to push against sometimes. This was where we began to carve out space for ourselves as partners. My role was to remember my partner’s symptoms, write down questions between visits and make sure that we asked them. No one gave me that role, we had to create it. In our birth class, my birth-partner role was clearer, though as a (future) father I was supposed to guide and structure rather than nurture. On the Birth Day (the day after my birthday incidentally), the popular media image of my role was still to stand around in scrubs, smoke a cigar outside or faint. What I actually wound up doing was coordinating with the birth-tub people, communicating with our midwives, giving directions, and ultimately sitting behind Annie as she entered the final stages of labor, holding her hands and breathing with her as she pushed our daughter into the world. Then holding both of them, cutting the umbilical cord, getting video of our birth team for Charlie’s first day of life, and making empanadas. I never would have imagined this role, and in all my years of TV watching I have never seen it. Yet in conversations with recent dads, more and more, these are the kinds of birthing experiences we are creating. It is within this context that I strive to be an engaged father. A parenting partner who’s got very little to do with some hetero-nuclear mythical norm and much more to do with what we believe in as a family: being a team, encouraging and supporting each other, and giving and receiving. Outside the man-box, inside my community and family, and throughout my life, my aim and orientation is toward engagement. Which doesn’t mean it still isn’t a stretch for me to be nurturing. I’ve been steeped in the disengaged-dad soup, too. The “wait till your Daddy gets home” disciplinarian still comes more easily to me than the supportive, affectionate confidante. My nature to nurture has been largely nurtured out of me because men aren’t socialized to be caretakers. I have had to consciously reconnect to what has been forced into a sort of cultural dormancy. So with the leadership of Amy Pak, who founded Families of Color Seattle, I’m taking a stand against dad disengagement and starting up a dads’ group for families of color in Seattle. 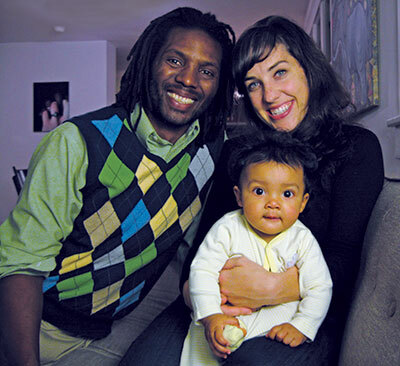 A space for dads centered on the intersections of race, ethnicity and parenting. A place to continue becoming the dads our children deserve and creating a world worthy of them. I invite fathers to visit FOCS online, and to come and join me. Teddy McGlynn-Wright was born in upstate New York and was raised in a multiracial, multicultural family. He moved to Seattle in 2006 and received his Masters of Social Work from the University of Washington. He has nearly a decade of experience working with groups moving toward racial justice. Several Dad groups can also be found in our long list of resources for "Finding Your Village."